The flu is an infection of the nose, throat, and lungs caused by the influenza virus. 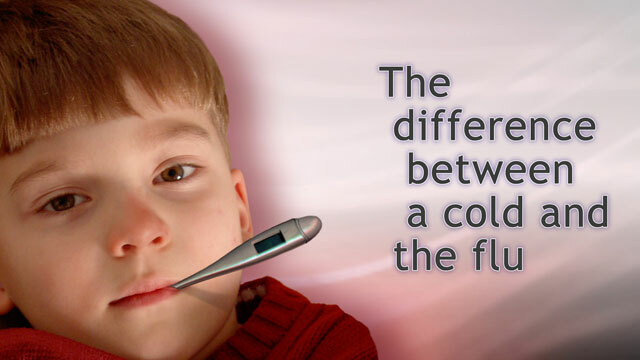 Many flu symptoms are similar to those of a common cold. Flu symptoms can also include fever, muscle aches, fatigue, vomiting, and diarrhea. Below are some questions you may want to ask your health care provider to help you take care of your cold or flu. What are the symptoms of a cold? What are the symptoms of the flu? How can I tell them apart? Will I have a fever? How high? How long will it last? Can a high fever be dangerous? Will I have a cough? Sore throat? Runny nose? Headache? Other symptoms? How long will these symptoms last? Will I be tired or achy? How will I know if I have an ear infection? How will I know if I have pneumonia? Can I make other people sick? How can I prevent that? What should I do if I have a young child at home? How about somebody who is older? What should I eat or drink? How much? What medicines can I buy to help with my symptoms? Can I take aspirin or ibuprofen (Advil, Motrin)? How about acetaminophen (Tylenol)? How about cold medicines? Can my provider prescribe stronger medicines to help improve my symptoms? Can I take vitamins or herbs to make my cold or flu go away quicker? How do I know if they are safe? Will antibiotics make my symptoms go away faster? Antibiotics DO NOT cure colds and flus. Are there other medicines that can make the flu go away faster? How can I keep from getting a cold or the flu? Should I get a flu shot? What time of year should I get one? Do I need one or two flu shots every year? What are the risks of the flu shot? What are the risks for me if I do not get a flu shot? Does the regular flu shot protect against swine flu? Is a flu shot safe for me if I am pregnant? Will a flu shot keep me from getting colds all year long? Can smoking or being around smokers cause me to get the flu more easily? Can I take vitamins or herbs to prevent the flu? Centers for Disease Control and Prevention website. Key facts about seasonal flu vaccine. www.cdc.gov/flu/protect/keyfacts.htm. Updated October 26, 2017. Accessed January 2, 2018. Centers for Disease Control and Prevention website. The flu: what to do if you get sick. www.cdc.gov/flu/takingcare.htm. Updated February 14, 2017. Accessed January 2, 2018. Hayden FG. Influenza. In: Goldman L, Schafer AI, eds. Goldman-Cecil Medicine. 25th ed. Philadelphia, PA: Elsevier Saunders; 2016:chap 364. Turner RB. The common cold. In: Goldman L, Schafer AI, eds. Goldman-Cecil Medicine. 25th ed. Philadelphia, PA: Elsevier Saunders; 2016:chap 361. Sore throat, cough, stuffy nose, sneezing, runny nose, fever, chills, and muscle aches are all symptoms associated with the common cold. Over-the-counter medicines for a cold only alleviate cold symptoms but do not shorten the duration of a cold. As always, drinking plenty of fluids and rest are most important for recovery from a cold.